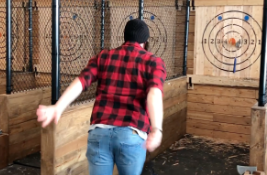 How to throw- AXE FACTS for success! Keep the axe blade pointed straight at the target through the whole motion. Holding your thumb against the back of the axe handle will help it stay straight and give you more accuracy. Start with the axe held out in front of you; do not start with it behind your head. 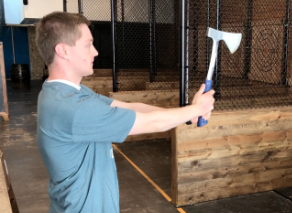 There are 3 ways you can throw an axe: two-handed overhead, one-handed overhead, and underhand. Dominant hand on top, both hands toward bottom of axe handle. One fluid motion as you swing your arms up. You shouldn’t be speeding up or slowing down as you complete your throw. 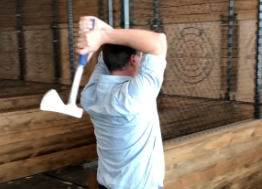 Release when the axe is almost right in front of your face, but don’t let your arms stop there! Finish with a follow through after the release (hands by your sides or even behind you). This may sound picky, but it really helps you get the right rotation, trust us! Don’t worry about flicking your wrists very much- the axe will rotate on its own if thrown with some power. These two things may sound similar, but you’re not so much throwing the axe as you are releasing the axe at the right moment. If that’s confusing, your coach at Heber Hatchets can explain it to you better. But the best way to get it right is just to practice, and feel it out for yourself! 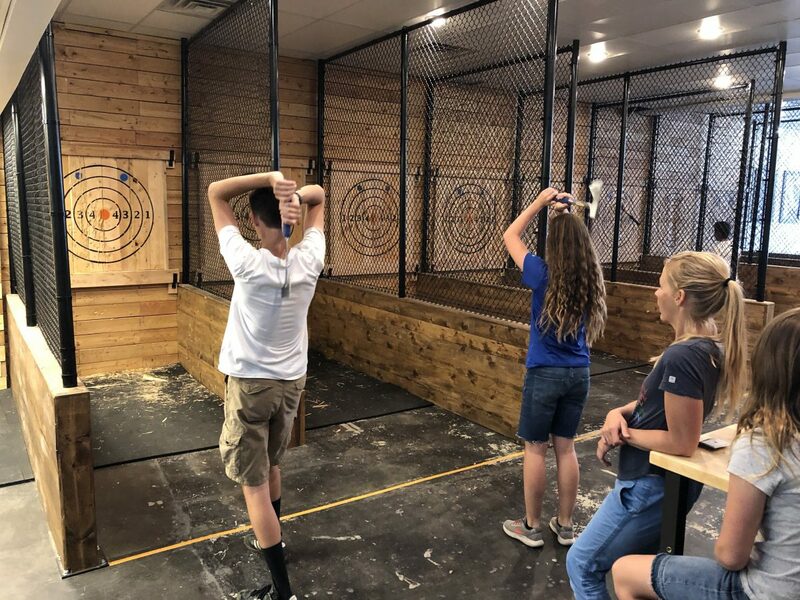 Now that you know how to throw, axe throwing can become your new “thing”. Come try it out!  Check out this axe throwing trick shots video of Heber The Hatchet Man and friends!